For decades, the Sandpoint to Spokane, railroad “funnel” community, who cherishes and relies on the clean water, air, and lands of beautiful Lake Pend Oreille and north Idaho for our shared economy and life ways, has endured the ongoing dangers and pollution of Burlington Northern Santa Fe (BNSF) Railway. The company hauls 95 percent of the volatile, fracked, Bakken crude oil, all of the heavy metal-laden, Powder River Basin coal, and many other toxic substances through the region, via its Northwest pipeline-on-wheels. It spews coal dust and diesel emissions, risks and degrades the health and safety of resident and visiting people and wildlife with pollution, noise, hazardous materials transport, derailments, and accidents, including three wrecked, coal and corn trains within 33 miles of Sandpoint, between March and August 2017, and dozens of injuries and deaths of pedestrians, family pets, and vehicle drivers and passengers over the last 20 years. Meanwhile, BNSF coerces local, state, and national citizens, elected officials, and emergency and regulatory agencies to accept and promote these escalating abuses of discounted, rural and urban, rail-line communities, advocating the consumer complicity and corporate conquests that drive gratuitous, unjust, global capitalism, basic human rights violations, and climate change. While BNSF questionably boasts about its local jobs and monetary incentives, interstate commerce rules ensure that Idaho receives no state taxes from transiting trains. Compared to the origins and destinations of rail freight, remote north Idaho gains much less railroad revenue and employment, and supports fewer state track inspectors and emergency response personnel and equipment. But like all greedy industrialists, BNSF now wants even more plunder for profit, in spite of the price already paid by people and the planet for its perpetually reinforcing, increasingly destructive expansion of fossil fuel infrastructure and invasion of our natural habitat. 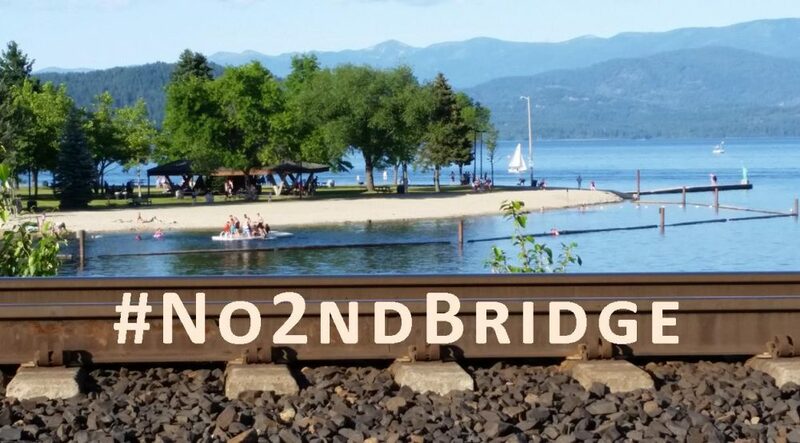 BNSF is planning to double two miles of tracks through Sandpoint, in close proximity to small, downtown businesses and the historic railroad station still used by Amtrak, and build two temporary, construction spans and three permanent, parallel bridges across the Bridge Street access to popular City Beach Park, over the Sand Creek outlet for stream flow, boat launches, and marinas to Lake Pend Oreille, and almost a mile and 1000 piles across Idaho’s largest lake, the fifth deepest in the United States. Apparently attempting to avoid, minimize, and expedite required, state and federal permitting and public notice and participation processes for this $100 million-plus, three- to five-year construction project, BNSF nominally postponed its Sandpoint Junction Connector project for three years, then visibly staged equipment and drilled and tested two piles for their bridge load bearing capacity and “done deal” public perception, at Dog Beach Park south of Sandpoint during summer 2017. Beyond its 250-page, joint permit application, full of engineering diagrams and lingo and inadequate, biological assessments, BNSF has yet to provide any unbiased, independent studies or reports describing and thoroughly analyzing not only the purported, public benefits of increased railroad infrastructure and traffic but also their potential, significant, adverse impacts on environmental quality, endangered species, regional safety, emergency response, vehicle traffic flow, noise and pollution levels, recreational experiences, tourism businesses, economic opportunities, and critical, lake and aquifer water resources. 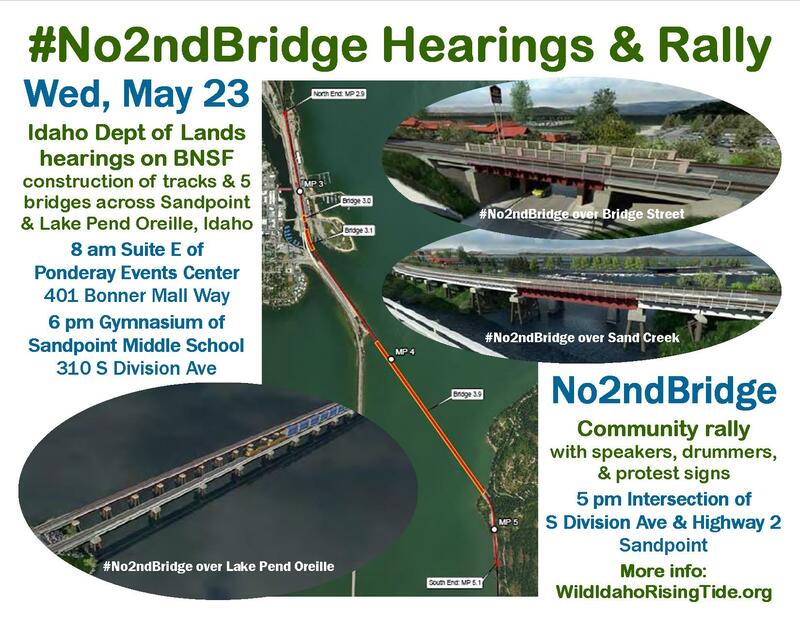 Please join Wild Idaho Rising Tide (WIRT) and #No2ndBridge allies in halting BNSF’s track and bridge expansion proposal: We need everyone on this frontline! Bring your best ideas, energies, comrades, and protest signs to a community resistance rally, with speakers and drummers at 5 pm on Wednesday, May 23, at the intersection of South Division Avenue and U.S. Highway 2 in Sandpoint. Attend and testify at one or both Idaho Department of Lands (IDL) hearings on the same day, at 8 am PDT in Suite E of the Ponderay Events Center, 401 Bonner Mall Way in Ponderay, and at 6 pm PDT in the Sandpoint Middle School gymnasium, 310 South Division Avenue in Sandpoint. Reasonably demand that IDL and the U.S. Coast Guard (USGC), who will also take public comments at these state meetings, respectively deny permits for lakebed encroachments, like temporary and permanent bridge piles, and for bridges across Sand Creek and Lake Pend Oreille. 4) Consideration of your input in final decisions, and inclusion of your comments in the public record for BNSF joint permit application PN_NWW-2007-01303 and associated documents. For further information and comment suggestions, see the enclosed links and continually updated posts on the WIRT facebook and website pages. The Army Corps, IDL, and Coast Guard cannot respectively grant dredge/fill, lakebed encroachment, and bridge permits, until IDEQ issues, waives, or denies Clean Water Act Section 401 water quality certification for overall project discharges that could violate existing, water quality standards. Please request notification of the public review period for IDEQ’s draft certification decision, and IDEQ denial of this permit.